Rejecting the charge as innuendos and falsehoods, Manmohan Singh said he was deeply pained by the prime minister's ill thought transgression. 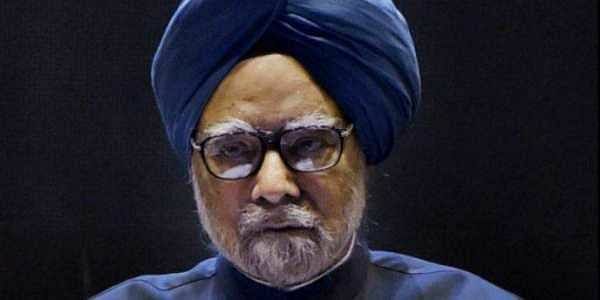 NEW DELHI: A rare row between a sitting and a former premier broke out today after Narendra Modi insinuated that Manmohan Singh colluded with Pakistan in the Gujarat polls with the Congress leader accusing his successor of setting a "dangerous precedent" and asking his apology. Launching a sharp counteroffensive, Singh tore into Modi over what he called the prime minister's "ill-thought transgression" and rejected his charge as "innuendos and falsehoods". In uncharacteristically strong words, a usually reticent Singh crossed swords with his predecessor to say the Gujarat polls was never raised by anyone present at a dinner hosted by Congress leader Mani Shankar Aiyar for a visiting Pakistani leader at his house on December 6 and that the discussion was confined to India-Pakistan ties. Congress spokesperson Anand Sharma accused Modi of dragging the political discourse to an "unacceptable low" by making statements that harmed the dignity of his post and demanded he apologise to the former premier. His party colleague P Chidambaram wondered whether winning an election was so important that such allegations can be made against a former prime minister and a former Vice President. Modi claimed that some Pakistani officials and Manmohan Singh met at Congress leader Mani Shankar Aiyar's house over dinner on December 6. This was a day before Aiyar's "neech" jibe against Modi that led to his suspension from the party. Singh issued a statement today, listing those who attended the dinner hosted in honour of the visiting former Pakistan foreign minister Khurshid Mahmud Kasuri. He said besides himself and former vice president Hamid Ansari, others present at Aiyar's dinner hosted for Kasuri, were the Pakistan High Commissioner, Natwar Singh, K S Bajpai, Ajai Shukla, Sharad Sabharwal, Gen Deepak Kapoor, TCA Raghavan, Satinder K Lambah, M K Bhadrakumar, CR Gharekhan, Prem Shankar Jha, Salman Haider and Rahul Khushwant Singh. "It was only about India-Pakistan relation, We didn't talk about any kind of politics." Gen. Kapoor, a former Army Chief, was quoted as having said Gujarat elections were never discussed at the dinner meeting. Claiming that his track record of public service to the country over the last five decades is known to all, he said no one, including Modi, can "lamely question it to gain lost political ground". Congress veteran Anand Sharma accused Modi of trying to polarise the Gujarat polls. Anand Sharma alleged that Modi was "frustrated" as he had sensed a clear defeat of the BJP in Gujarat and was resorting to use of foul language in his bid to whip up emotions and polarise Gujarat. "There cannot be anything more as explanation and there cannot be anything more reprehensible than what he has done," he alleged. "The prime minister should restore the dignity of the political discourse, withdraw what he has said and apologise to the former prime minister and the former vice president," Sharma told reporters in Delhi. Congress president-elect Rahul Gandhi, who is campaigning in Gujarat, urged the PM to focus on the State instead. “Modi ji, it is Gujarat’s elections, speak a little about the State instead,” he said. Pakistan on Monday dubbed as “baseless and irresponsible” attempts by Indian politicians to drag it into India’s domestic politics. Pakistan Foreign Office spokesperson Mohammad Faisal tweeted “India should stop dragging Pakistan into its electoral debate and win victories on (its) own strength...”. Virtually ruling out an apology by Prime Minister Narendra Modi, Finance Minister Arun Jaitley on Monday charged former prime minister Manmohan Singh with defying the national line by meeting Pakistani diplomats and demanded to know the context, relevance and necessity of such a meet.